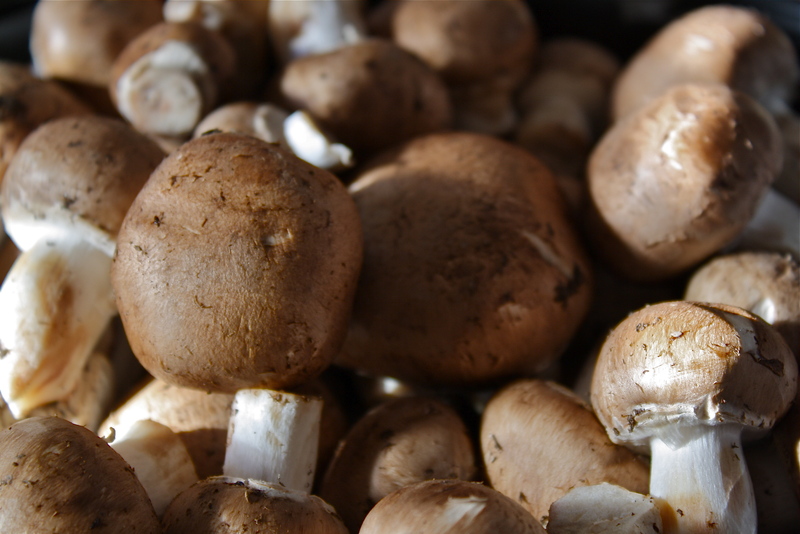 Mushrooms contain flavonoids and antioxidants, which means they make the meal taste good while being good for you. Also a good source of protein, phosphorus, vitamin D…..you get the picture. I like crimini mushrooms, which are little portabella mushrooms. They have great flavor and are relatively inexpensive. I believe they have more flavor than the standard button mushroom you see in your grocery. I decided to make a dish where mushrooms were the star, so to speak. Sauteing them in olive oil with herbs brings out the earthy flavors. I added a slightly sweet red wine and let them cook down a bit. Mix in a little soft tangy cheese for a bit of creaminess and some fresh parsley to brighten it. It’s simple, fast and tastes pretty good. This one comes together in about 30 minutes. If you don’t have or are not a big fan of goat cheese, feta makes a wonderful substitute. I served this with pasta. You could use potatoes or whatever you prefer. Add grilled chicken if you like (I did). If serving over pasta, put a pot of water onto boil, cook according to package instructions and drain. Clean you mushrooms-I just put them in a colander, give a good spray with water and shake them off. Half the little ones, quarter the medium ones. If you have big ones, cut the quarters in half again. Heat a medium skillet and add your olive oil. 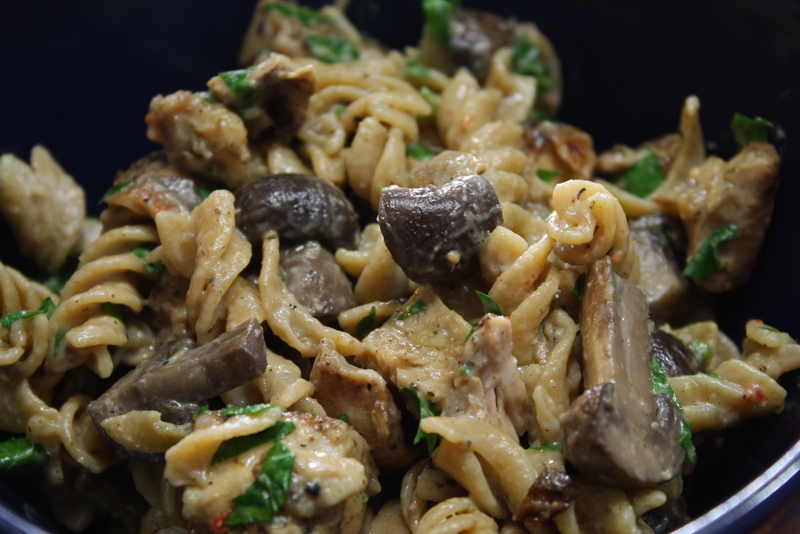 Toss in the mushrooms and saute until they release their liquid, sprinkle with garlic powder and let the liquid reduce by half. Add the wine and herbs and let it reduce again by half. Reduce heat to low. Add fresh black pepper and cheese, then stir to melt. If sauce is too thick, add a little half & half/milk to thin. 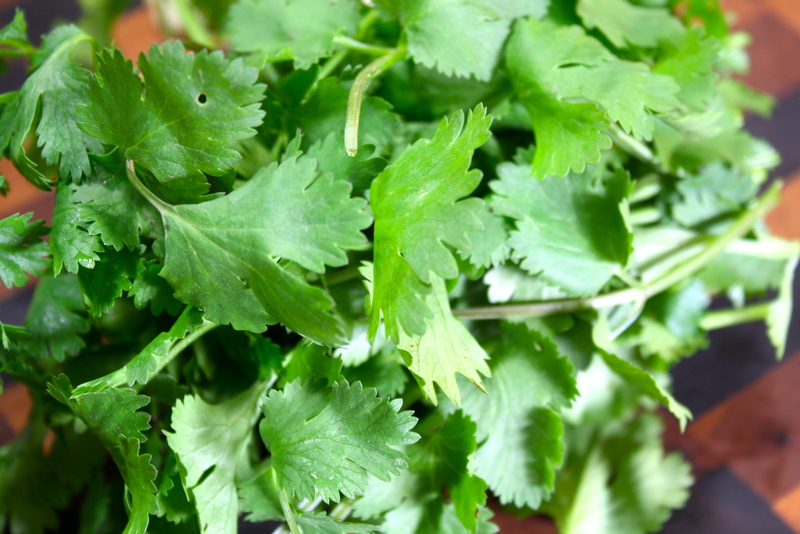 Sprinkle with fresh parsley and stir. Taste and add salt if needed. Serve as desired (over pasta this time). Enjoy!